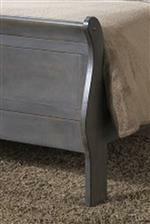 Elegant and upscale, this chest of drawers offers a classy piece to add storage space to your master suite. With five large drawers, plentiful room is given for tucking away miscellaneous bedroom items, including clothing, apparel, and linens, among other accessories. Drawer fronts are decorated with beautiful hardware pulls that add a traditional look and feel to the otherwise simply styled piece. Complete your bedroom with the warm presence of this chest of drawers. The 4934A 5 Drawer Chest w/ Bail Handles by Lifestyle at Beck's Furniture in the Sacramento, Rancho Cordova, Roseville, California area. Product availability may vary. Contact us for the most current availability on this product. Storage Five spacious storage drawers.